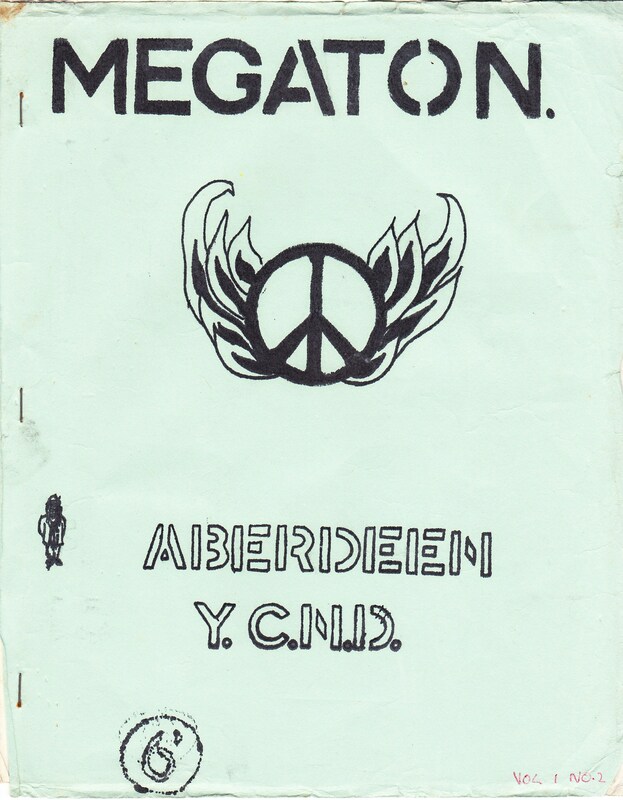 As a follow up to Singing Ding Dong Dollar blog here is another copy of Megaton, Aberdeen youth ban the bomb’s magazine from the summer of love 1967. 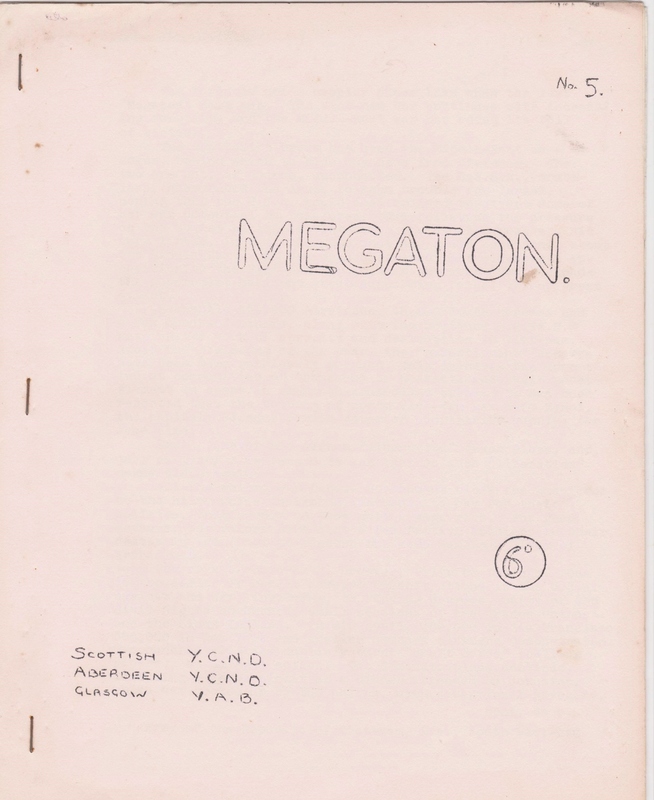 Scott MacKenzie was the vinyl of choice with his hit San Francisco which you might want to play while perusing this recently uncovered edition of Megaton. The quality is poor but hey, it was nearly half a century ago. 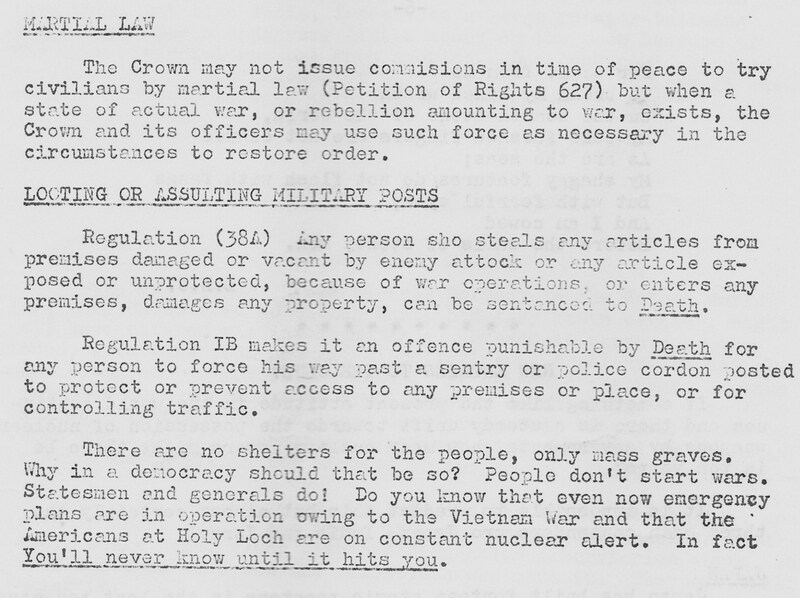 The diary of a 15 year old girl involved with Aberdeen Youth Campaign for Nuclear Disarmament in 1965 was recently given to me. It is in fact a blue school jotter and the few entries run between August and October of ’65. 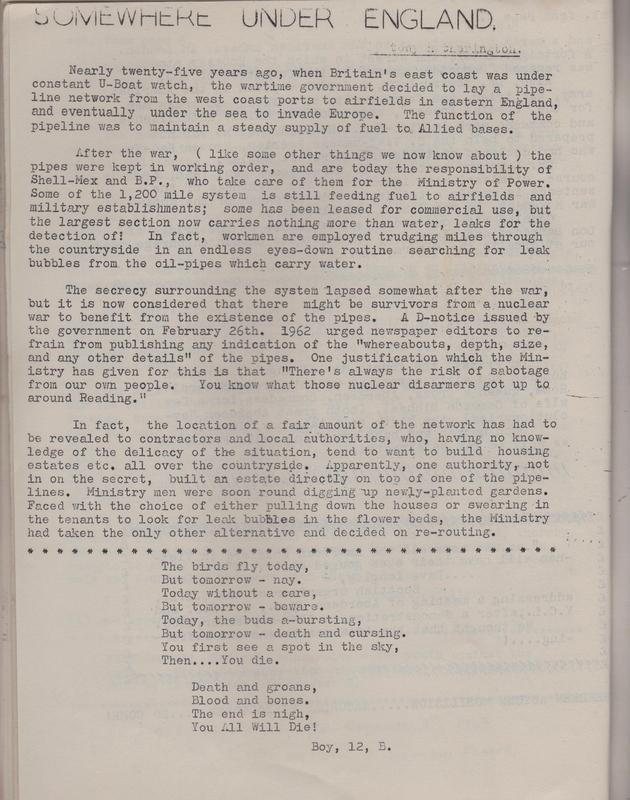 One or two parts have been edited and most names have been shortened to initials. A few spelling changes have been made. Clicking on images brings them up to become more legible. 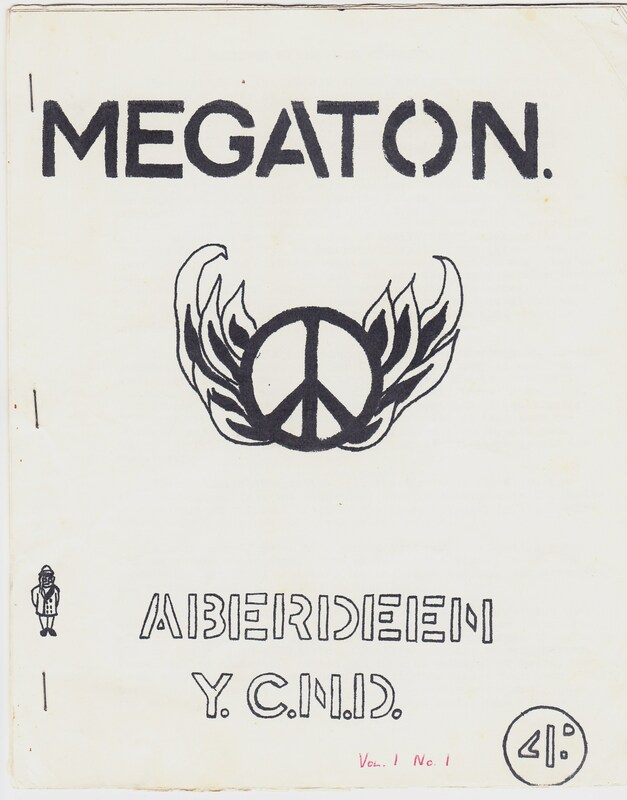 Megaton was a magazine produced by YCND in Aberdeen. Sat 7th Vigil at Union Terrace in memory of Hiroshima day – Aug 6th 1945. Time was 10 a.m. to 6 p.m.. I left about 5 and there wer e many people taking an interest. 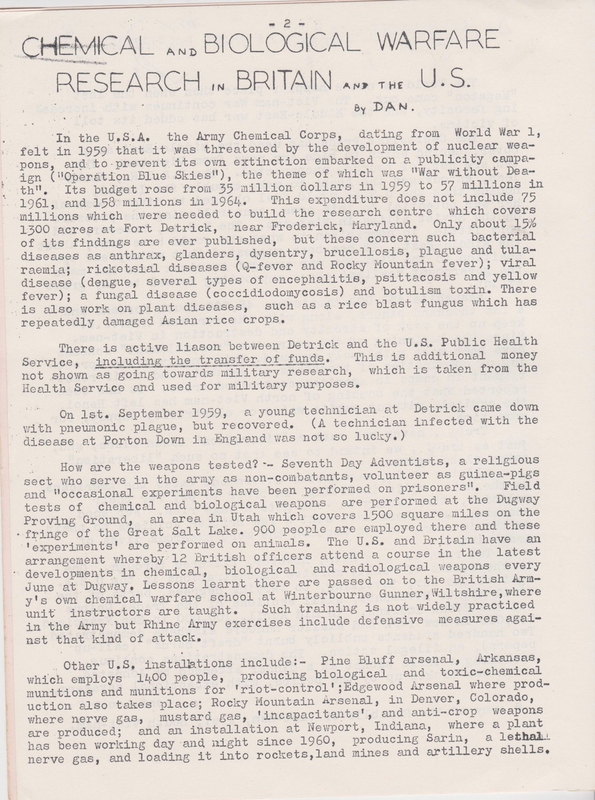 Hiroshima day leaflets and copies of Sanity were distributed. 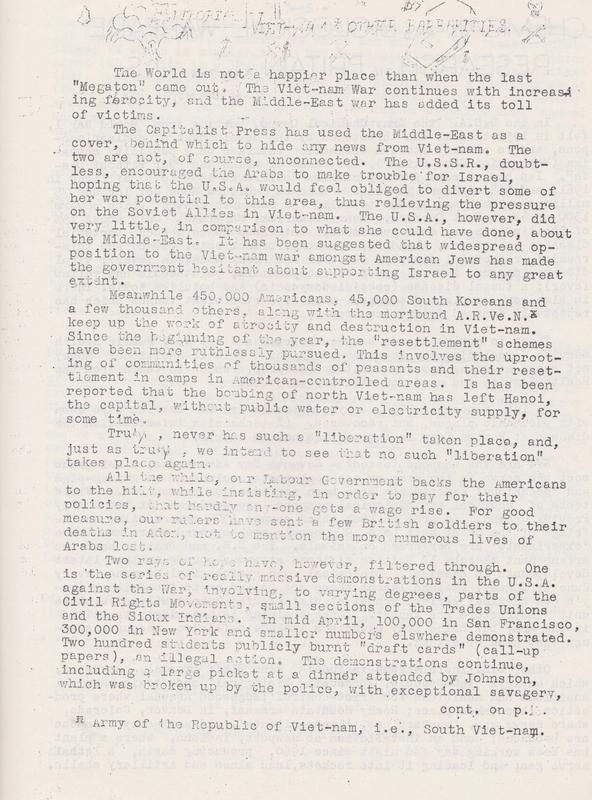 Sun 8th March at Northfield – different groups – about 50 – for Hiroshima but mainly in protest at the fall-out shelter situated in Northfield . Had a number of people speak but practically no-one from the houses came out though many were gaping from windows. Sat 14th About 20 of us – not wearing badges – went up to the open day at the. 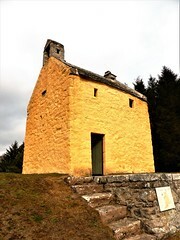 Barracks. (Bridge of Don) . It was fantastic. Little G had stinking water and some other things, we left slogans and signs. All in all caused a bit of sabotage! 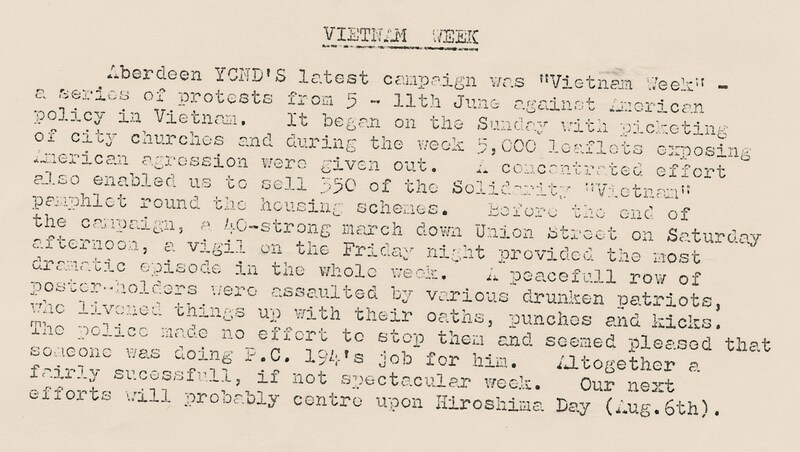 Eventually we were found out to be CND and from that time on – about 4 o’clock until 5.45 – we were followed everywhere, by soldiers and officers. Plain clothes police were around taking photos. We made a fool of the soldiers following us, some of the time. Hoards of them. 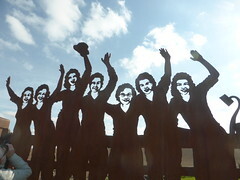 They lined up between us and the grass – where the bands were parading in case we chanced running on to the field. Had an argument with the chaplin outside the gate at the end. Sun 15th Meeting at 2.30. Discussed a march by the Y.S. (Young Socialists) on the 28th for Vietnam and the anniversary of the death of Trotsky. We are having a continuous march up and down Union Street on the 4th September. I signed the schools pledge. Large amount of people – over 30 at the meeting. Sun 22nd Over thirty at meeting B and C did most of the speaking. I.S. was outside for some reason. I ordered a number of magazines and papers. 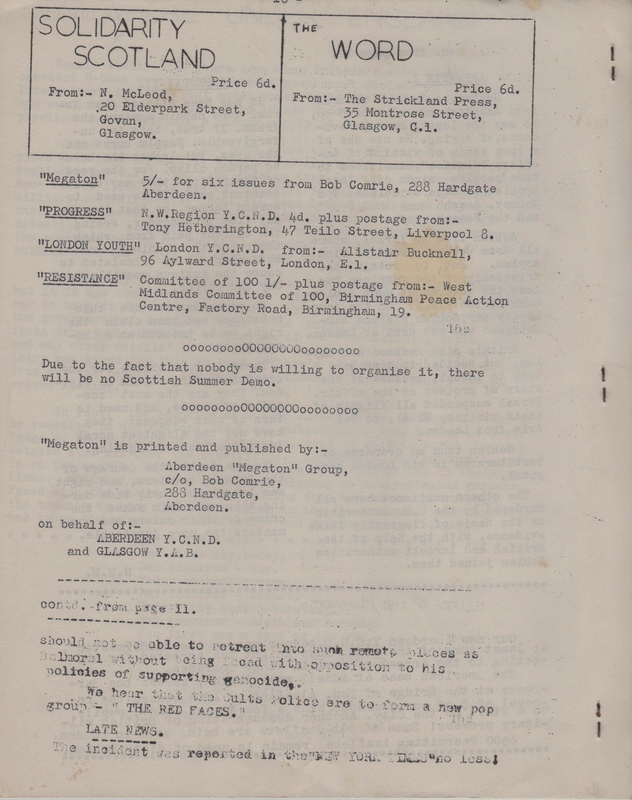 We’re having out own newssheet soon – Megaton – the Y.S. march set for this Sat is off. Something to do with it not being Trotsky’s death anniversary or something. There’ll will be some-one from Y.C.N.D. at the Adelphi every night this week, making posters and duplicating bit from Aug Resistance. A list in it about to-days Educational system is to be duplicated. Tues 24th I went along about 3.45 and they are distributing the ‘schools’ leaflets. Most have gone to the Grammar, so there should be a big outcry in the near future. The area convenor system started about a week ago is in full swing. 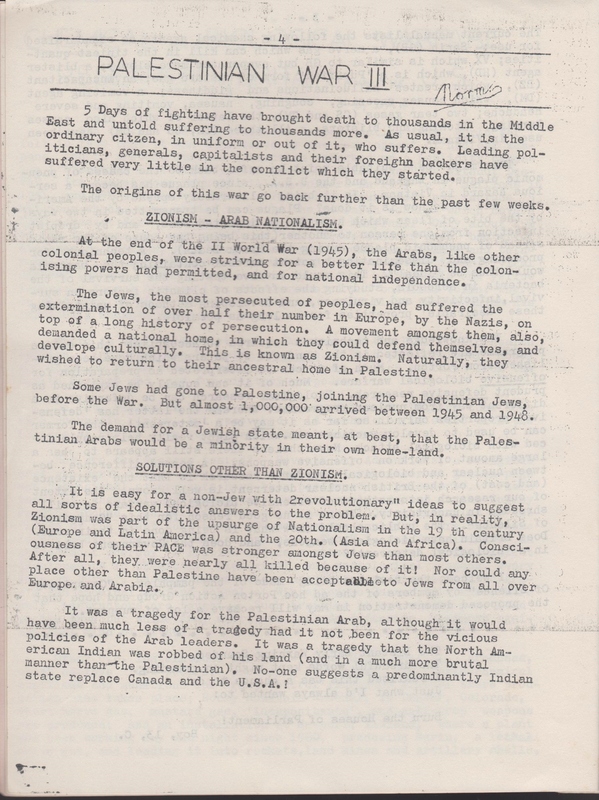 There are special leaflets duplicated with information to help the convenor with his/her work. I am convenor for Rosemount – Area 11. Wed 25th Went along to the Adelphi. Most of the schools leaflets gone. Some small posters were made. B and I were out white-washing last night until 5 a.m.. M says B not coming back to Y.C.N.D. .
Thur 26th In to-day’s Evening Express there was a long column in the front page giving a write-up on the ‘school’ leaflets. There were things quoted from Goldie – rector of the Academy – he treated it all as a school-boy prank. They tore the thing practically to pieces. We had a schools CND meeting . Little G doing most of the speaking. Only about two new faces. Jimmy Milne wasn’t going to let us have the place – I think he’ll be very sticky in the future. 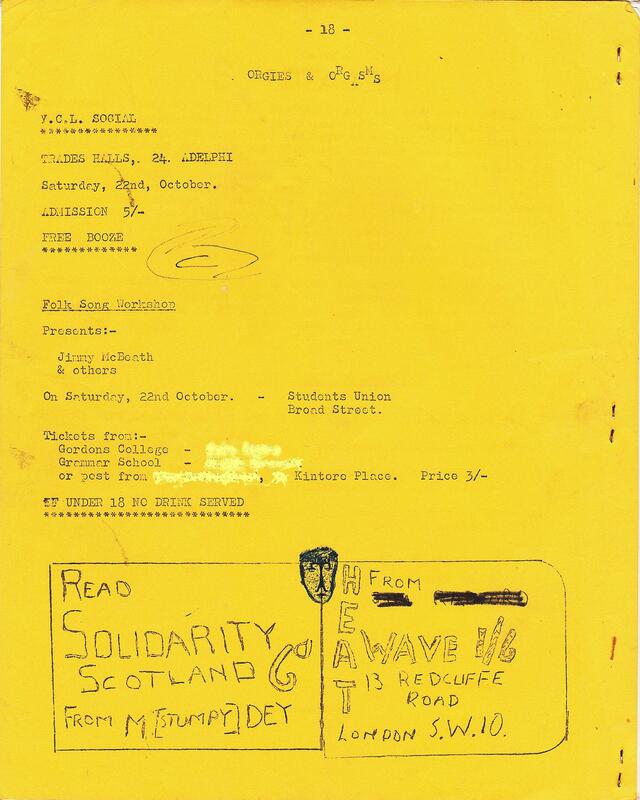 The meeting didn’t go altogether too well – approx 15 there – small leaflets are to be distributed in different schools, as a campaign to get more supporters – and a name and address of a person, or class, that the folk can get in touch easily. C, G and me went along to the Evening Express afterwards about the write-up in the paper concerning the ‘schools’ leaflets. It was a bit hellish. C spoke most of the time. G opened his mouth a few times and more or less kept putting his foot in it. I only spoke about twice but I think I was more careful. 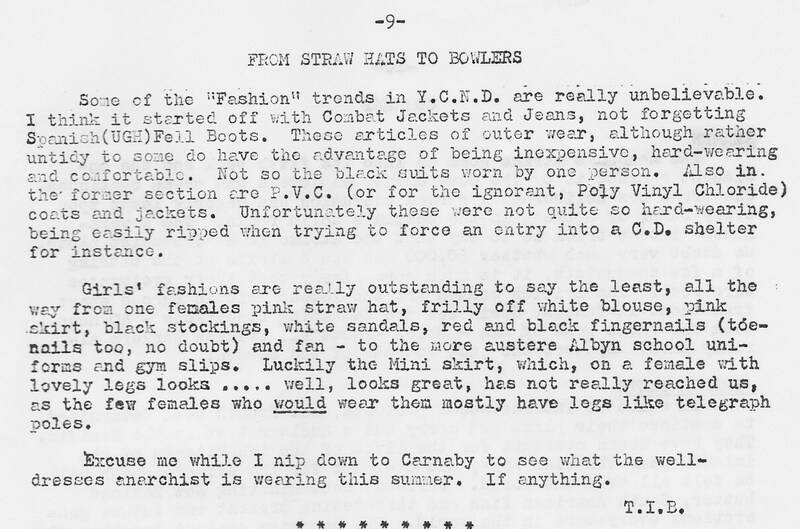 I’m sure the reporter knows, though we denied the fact, that we are part of the schools anarchists – though actually the organisation doesn’t exist – G was keeping his ears flapping and found some reporters discussing the South Y.S. split up. When we left they were getting in touch with N M.
I’s excited about all this but P’s pressing him to get out of CND and I think he will be – very soon. C’ also getting fed up and B may have left also. Friday Aug 27th JG and DT asked to join the Y.C.N.D. and I got CM to do so as well. There was nothing at all in the papers- morning or evening to do with last night’s interview. 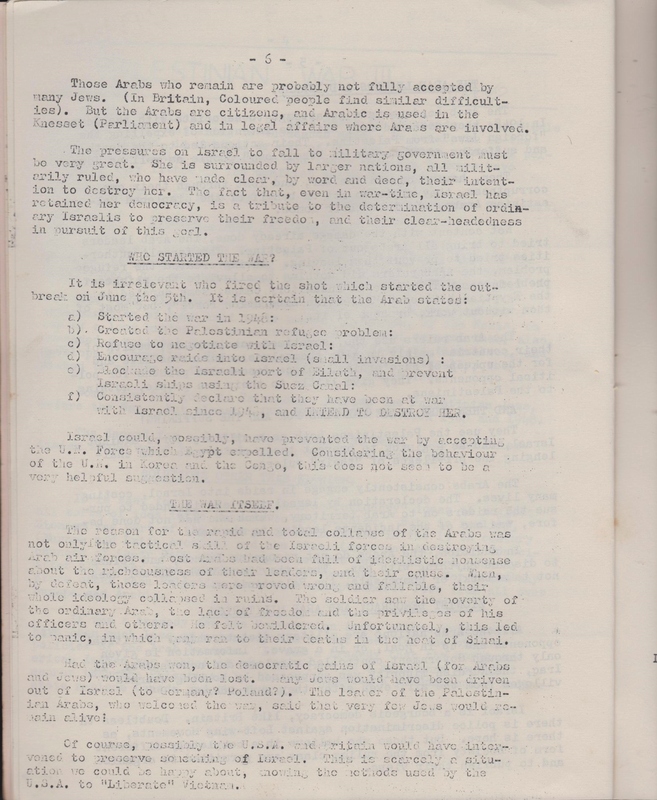 3red Sept Went round to see KM – on Convening Area- she was out. I got her mother. Left a sheet and note to come to meeting on Sunday. Don’t think her mother’s too keen. 5th Sept Went to meeting. Over 40 there. There is a march next Saturday. Were supporting the Y.S.. KM never turned up that I could see. Were looking for premises so I’ll write to that place in Bon-Accord Crescent. B’ back. I stayed out of everything. P’s wanting him to give up Y.C.N.D. altogether. Yesterday people were out selling Resistance. We hope to have a dance at Christmas and a fast lasting from Christmas eve to Boxing Day. 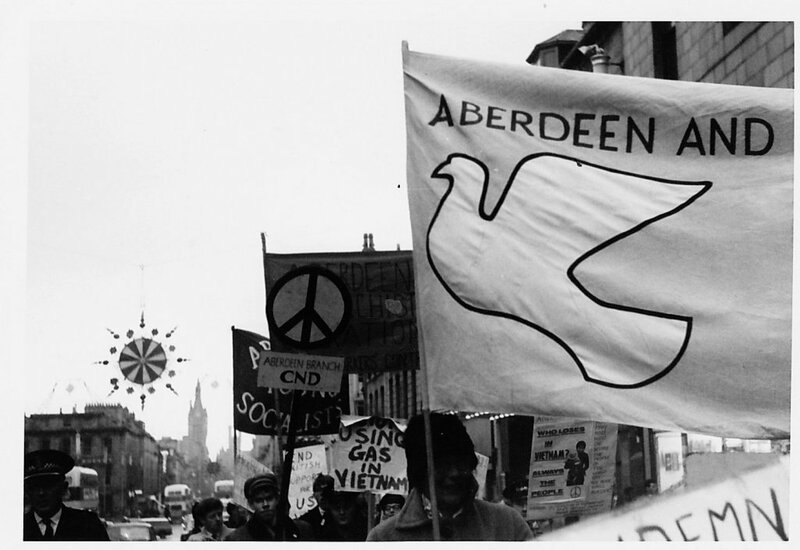 Hope to march to Faslane at Easter instead of the Aldermaston to London one. Trying to get a name for out peace-factory. CND are meeting to-morrow night in Y.M.C.A. Union Street. 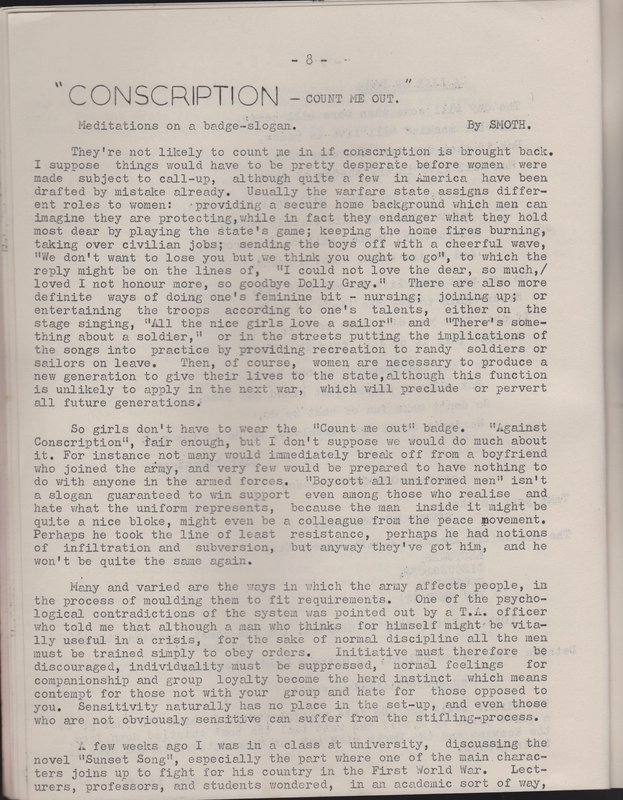 Typed out a letter to SH, HP and JD – convening system – save me going down to them and letter to London Assurance to see about renting their basement. Today’s Sunday Mail had an article on Aberdeen’s School Anarchist’s Federation. Someone went to see them from Y.C.N.D. . Were mentioned as having something to do with it. Rosemount is one of the 5 or 6 school mentioned. Wait for it on Monday! 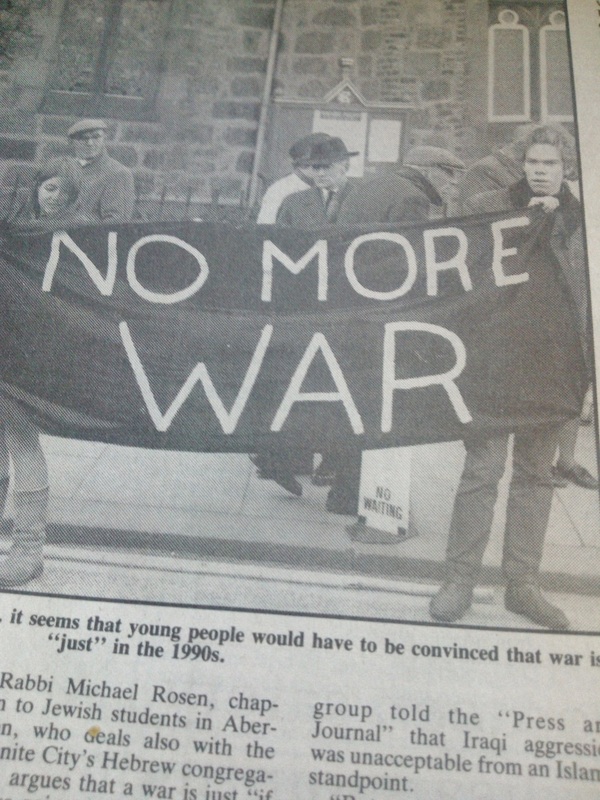 Mon 7th Sept Went to Adult CND meeting to which Y.C.N.D. was invited. There was a great majority of us including Y.S. and Y.C.L.. IS took a great hand and other speakers from our side spoke sense though sometimes it was a bit obvious they were hazy on what to say next. The adults cried us down for everything. IS was refused permission to answer back sometimes except when he did it forcibly. What the majority of the adults put forward was complete trash. KC made a very concise and good voicing on just what or rather what not, the adult CND were doing in trying to win peace. They had described us in some article a while ago as young homeless layabouts who went around sleeping with each other in old houses. I should think they’ve changed their minds. 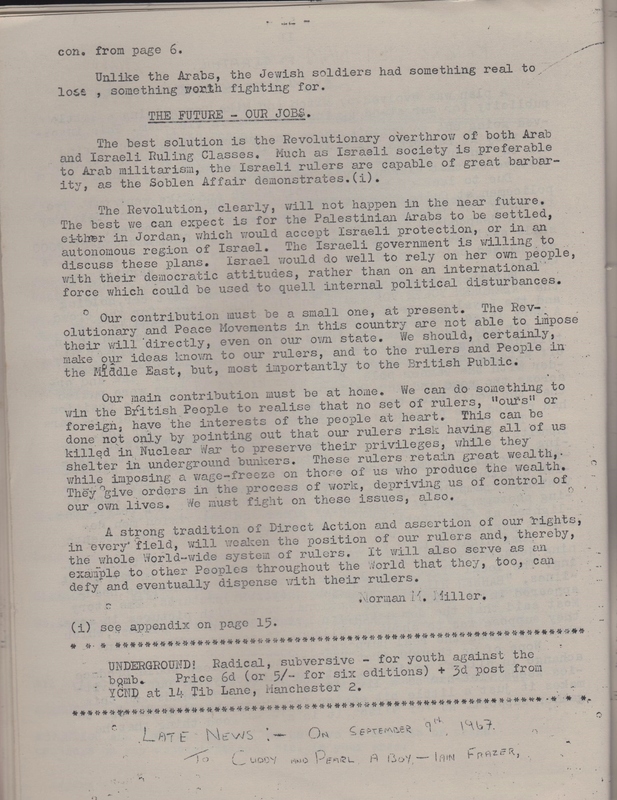 A resolution was put forward by Mrs Clopper and one by NM was at first not going to be accepted but after a disturbance from us, was. 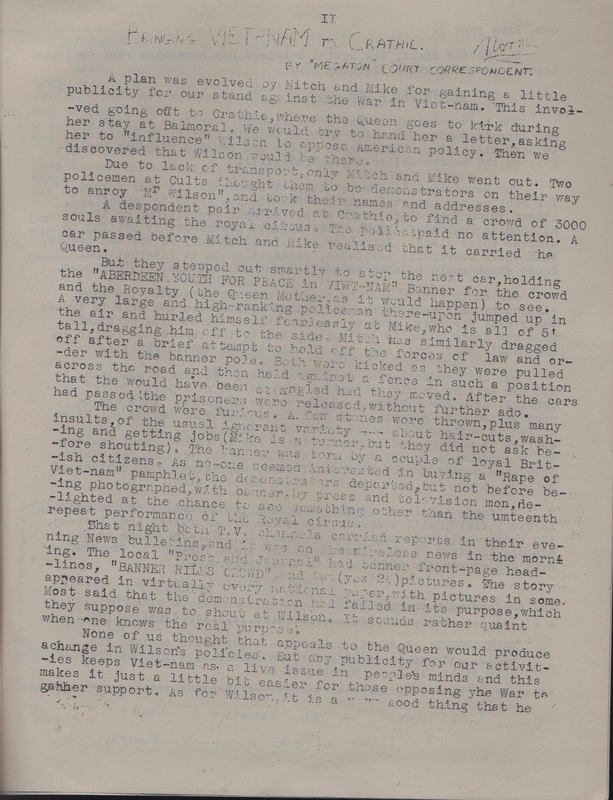 With our majority, N’s –a Vietnam piece- was passed while Clopper’s – on Vietnam, much the same but not so definite was not. They said they would not give it to the press as they had decided – because they had paid their subscription fee – that they had a right to stop it. We argued and later they said they would give it but N, G, C and myself went along to P & J office – gave it to one of the blokes. J and his female friend joined us. C & I left so we don’t know how N got on. A*** asked C why CND was doing what it was as it was supposed to be a non-political group. He told me (C) that he put his foot in it so whatever was said, I hope A***, the rat, doesn’t print it, knowing him, he will. 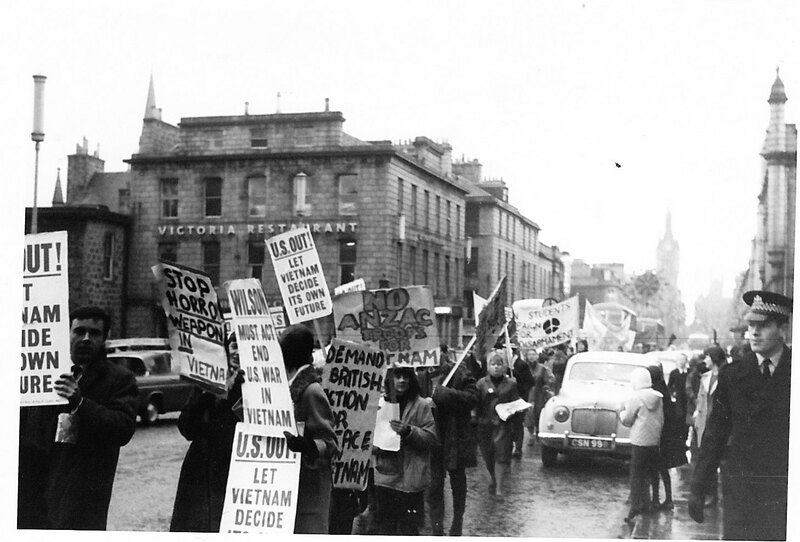 Sat 11 Sept A march up and down Union Street about Vietnam and supporting the Viet-cong. It was a Y.S. march with a minority of Y.S. there. 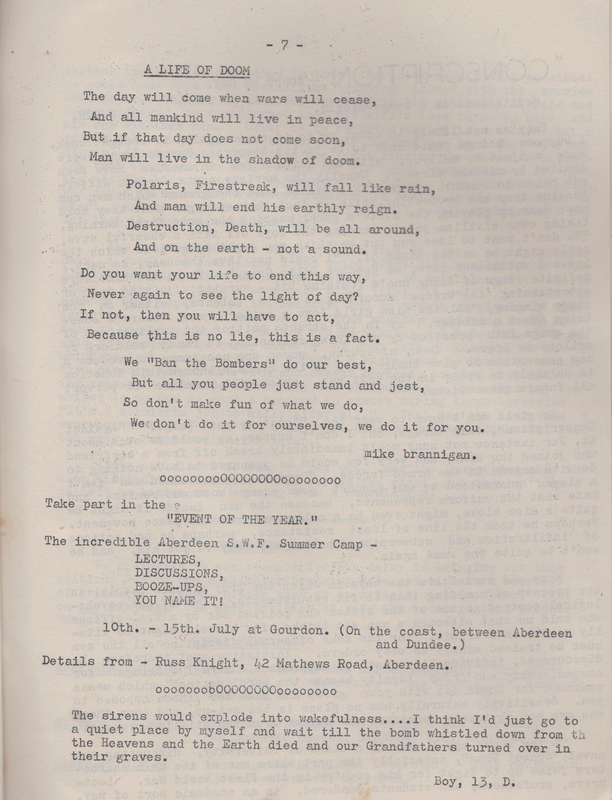 Y.C.L, School Anarchists, A.A. (Aberdeen Anarchists), Y.C.N.D there. Total amount about 55. More had intended coming so it was a bit of a let down. I think, though, it was in fact, quite successful. Dave Langley from the Y.S. in the south spoke at St. Margaret’s afterwards. What a lot of mush at one time. He was pathetic, all doo-daddy and join the Y.S. – to hell with everyone else. B made a few words for Y.C.N.D but was insulted by Langley. IS and some others were taking photos of the march. Night A Y.C.L. party at 8 that night. I went with C and ended up with KC. Paid 5/- to get in. I got very little food, only a handful of peanuts. Plenty of booze. It was very good. Sunday 12th Y.C.N.D. meeting in Adelphi. Taled a great deal about last night’s party. NM got into an argument over Dave Langley’s talk yesterday. IS really gave him it. 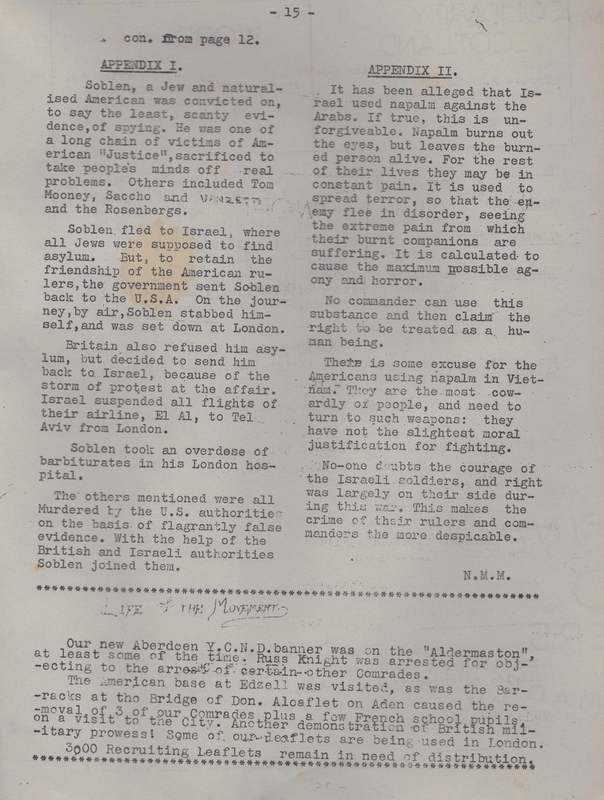 Was proposed that a big number of us make trouble for the army etc and one Saturday go to the Information Bureau and start arguing and demanding to join the army – in other words – make trouble. Over 40 at meeting got over 30 names. Suggestions to hold a picket outside Marks and Spencers in protest against South African goods. It was supported. Still on the search for premises. Convening system is scrapped. Sunday 19th Y.CN.D. meeting. No meeting next week-end unless some folk want to hold one, the main folk are going to the hills. Decided against a picket. Each person gave 6d to enable Y.C.N.D. join. Suggested we form a Scottish Y.C.N.D.. JG etc are writing letters putting us in touch with other Scottish Y.C.N.D groups. Suggested that starting in a couple of weeks Y.C.N.D should break into small groups of a few people, given a subject to discuss and then give the opinions of the members this way. Were doing this because everyone seems too shy to speak and it may be easier if there’s only a few people altogether. Decided to have a special date when parents can come and argue about Y.C.N.D. Fri 24th B, L, C. M, M, B, C, DR, A, JG, DT, HP, I and me went to the hills. Stayed at the stable at Gelder. Met the Queen etc on Monday before leaving. Sat 2nd Wilson arrived for weekend at Balmoral. Y.C.N.D. went out along with Y.S. etc to meet him at Dyce. About 40 of us. He got away by another exit and we chased after him without any success. Sun 3rd Y.C.N.D. meeting. About 60 attended. Took 6 Resistances to sell and a collection sheet. There was a strong reaction against some of the whitewashing done. We divided into groups at the end of the meeting and had discussions. There is a lot of strong feeling against the Anarchist supremacy in Y.C.N.D. mainly by Y.S. and Y.C.L. Sold almost 200 Resistances. Mon 4th Public meeting on Vietnam War in Music Hall. Same old stuff. Bit of spoken conflict between the youth and older members of the audience in open debate after the talk. Quite a few Y.C.N.D. members attended. IM is going along to try and get into the ’62 Club folk singing to-morrow night with my help. Tues 5th Met IM and M outside Club. JI obviously told Mrs B of them and I was worried about having them in the club. ‘We don’t think that they are particularly the kind of people we desire in the club’ – quote from B. Folk singing was pretty much a drag. The IM – Y.C.N.D. relationship is not exactly good! I was invited back by the members, they seemed to have liked him. 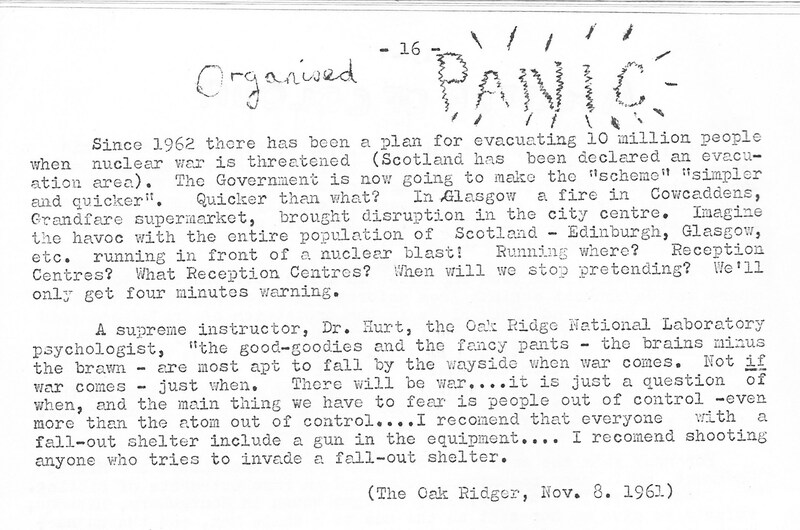 Fri 8th Phoned IS in the morning about some members going out to look for the Cults fall-out shelter. Skipped school by playing ill in morning and being sent home. Met M, M and IS at ‘Edward’. 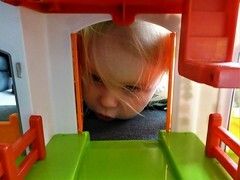 At Cults IS and M went in one direction and M and IS went in the other. Searched for about 2 hrs. Only found a possibility the erection of a new part to a hospital or home. Sat 9th (Some references to direct action ending with) This town’s getting busy! Sun 10th Meeting. About 60 attended. Bit of a shambles. Split up into groups again. JG, DT and I decided to go to I’s late birthday party on Fri and then go whitewashing. Some members think we have a spy and the no 1 suspect is T – which I refuse to believe! Mon 11th M, M and me went magic markering! We covered quite an area. People should be realizing there’s a Y.C.N.D. by now! The Revolution’s near! Tues 12th Anarchist meeting Skene Square School. Only 12 of us were there. 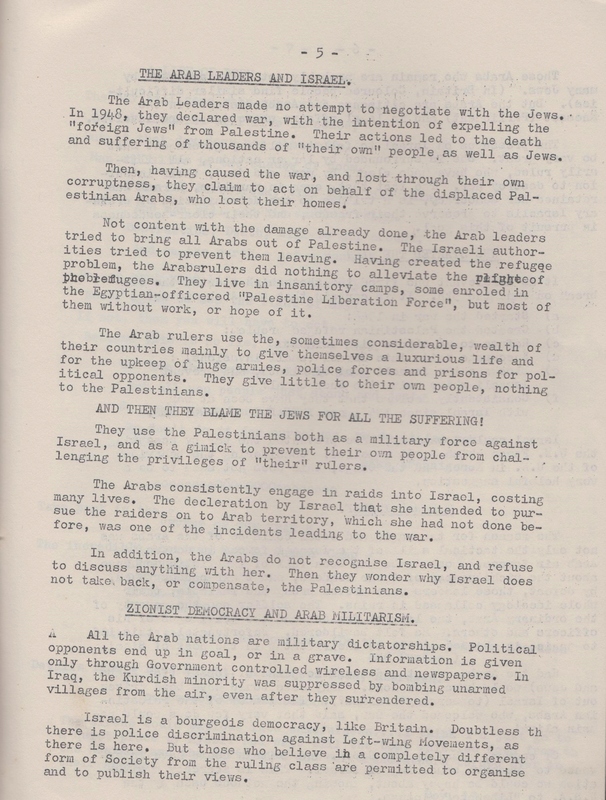 Nothing was really discussed – not to do with anarchy at any rate! IS was speaking on the subject at the University. F managed it. Fri 15th Some of us went up to B’s flat and prepared whitewash. International Vietnam day is to-morrow and we’re advertising out vigil and march. Sat 16th Went out whitewashing at about 12.30 a.m. . Did a lot of work. M and M were picked up by the cops at 2.10 a.m. and kept until 5 a.m.. They went back whitewashing when they were released. There was also another group out whitewashing. We left B’s flat at about 9 in the morning. Some folk waiting for the vigil so it ended at about 12.45 p.m. . Not a great success at all. March at 2.30 Market Stance. There was about 60 of us. Went down Union Street to Albyn Place and came back. Dumped some banners in the Adelphi and had a public meeting, decided on the spur of the moment, at the big space beside Marks & Spencer’s. As F was ending it, a couple of cops, after phoning the station, came over and broke the meeting up. We all then – about 40 – walked right into the main hall of the police place in Lodge Walk and sat down. 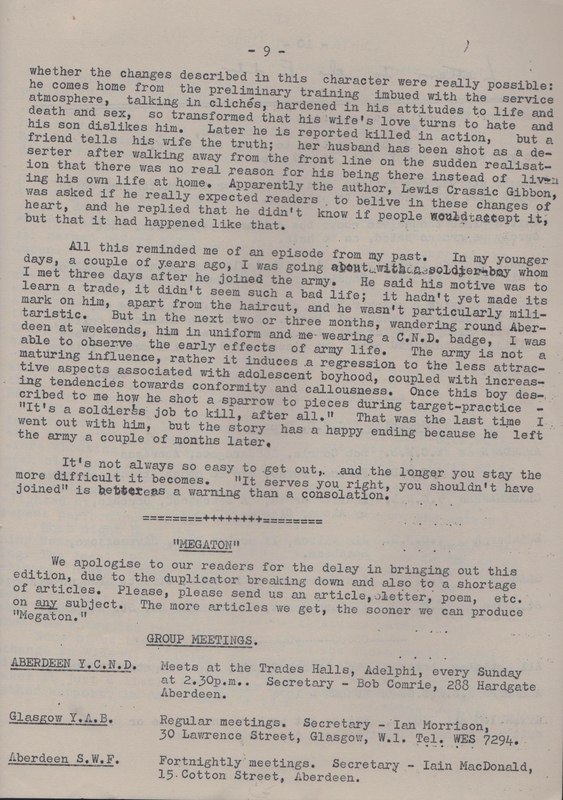 G and F acted as spokesmen and went into another room with a sergeant. A sergeant came into the hall and chased us out. We were protesting against the lack of free speech in Aberdeen so most of us wrote a complaint and handed it in. They weren’t accepted because they weren’t headed correctly or in envelopes. It was decided to re-do them and send them all in together. G and F got absolutely nothing from them. Had the teach –in in St K’s at night. Not many new folk there. Sum 17th Meeting. Almost 60 there. It wasn’t very good. Nothing much was discussed. Sat 23rd Made up some small posters advertising Y.C.N.D. and stuck some up – needless to say, they very soon will be pulled down. The rest of Y.C.N.D. don’t know I’ve done this but they are always on at us to do things off our own steam so this is my contribution. Sun 24th Meeting. Discussing possible ways of getting more funds for Y.C.N.D. . J, D and I have an idea which we don’t expect to carry out! 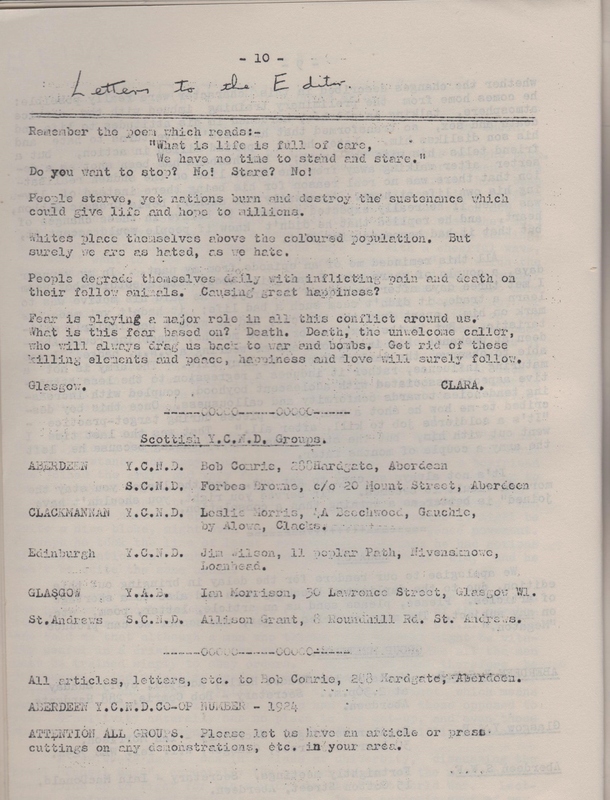 Suggestions – Folk Song Concert, poetry magazine, jumble sales etc. Someone from Ilford is supposed to be coming up next week-end. Over 60 at meeting. Mon 25th About 40 of us went in groups to the R.O.C. open night at Northfield. Some whitewashing was done outside. Two cops were there. Some nasty questions were asked by us and we got some nasty but not surprising answers. It was admitted that Aberdeen’s population would have no-where to go in the 4 minutes warning, if a bomb was dropped on the city. 140 people can get in the R.O.C. place and unless a bomb is directly dropped on the building, these people will be completely safe. The Is, M and M weren’t up. Tues 26th Again we went up to the R.O.C. place. It is opened for two nights, last night and tonight. M and M were there but still not the two Is – they were going to try and get into the 62 Club folk singing. Those of us who had been in the R.O.C. place last night were recognised and didn’t get in. Two cops were outside and took us all up to the gate. Bangers etc were let off. Some stink bombs and things were put in the building by those who got in. Nothing of great value was done. The folk treated us like morons trying to make us believe that all we said about dying was rot. The argument put forward on Monday night by the bloke I was with was absolute crap. 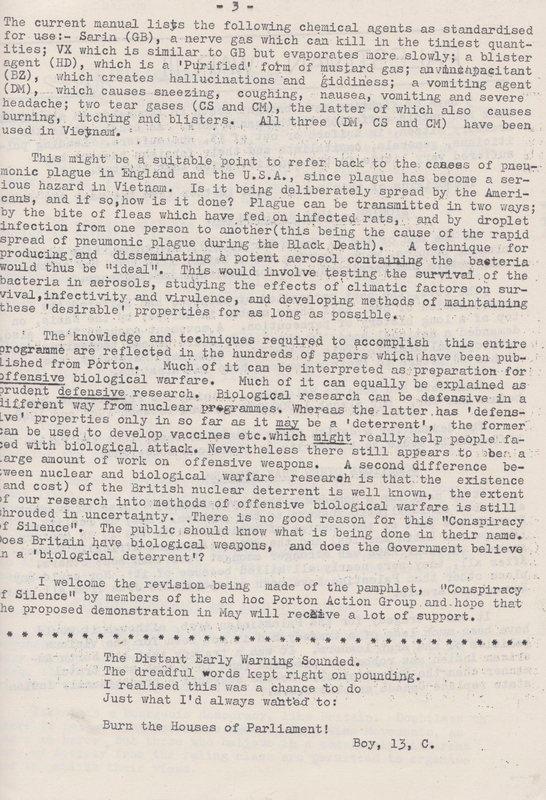 After asking what good was their signals to the people in Aberdeen if they had nowhere to go for safety but had in fact the knowledge that in a few minutes they would all die a horrible death – he said that the governments who built them didn’t really expect them to be used – that no bomb would be dropped. 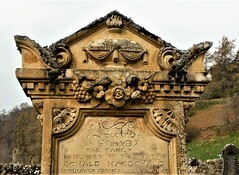 ‘Then what good are they – the money used in building these places could provide food for the starving in Vietnam or China.’ He couldn’t say anything, just sighed pretending we were mad in what we said. This was a bloke who had over 90% in his R.O.C. exams and was given a high post. He looked away and shook his head – we waited for a reply but were told it was time to go. It was pathetic. These are some of the questions I asked, the others were also firing ones at other R.O.C. folk. Sat 30th Y.C.L party. JG and I went by accident. A crowd of Y.C.N.D ers there but for a long time no Y.C.L. . There was an admission fee of 2/6 which some of us didn’t pay. We also had to pay for drink and when a fuss was made were told we could have our 2/6 back and leave. We left along with some 2/6 which weren’t put in by us in the first place. A great amount of their literature is now blanketing George Street. J and I hope to go to Dundee tomorrow and see some Y.C.N.D. folk there. Couldn’t find IM to get money for fares off him so N lent us £1. Sun 31st J and I went to Dundee. Went to EQ’s house and he took us down to Bob and Una’s place in Peddie Street. 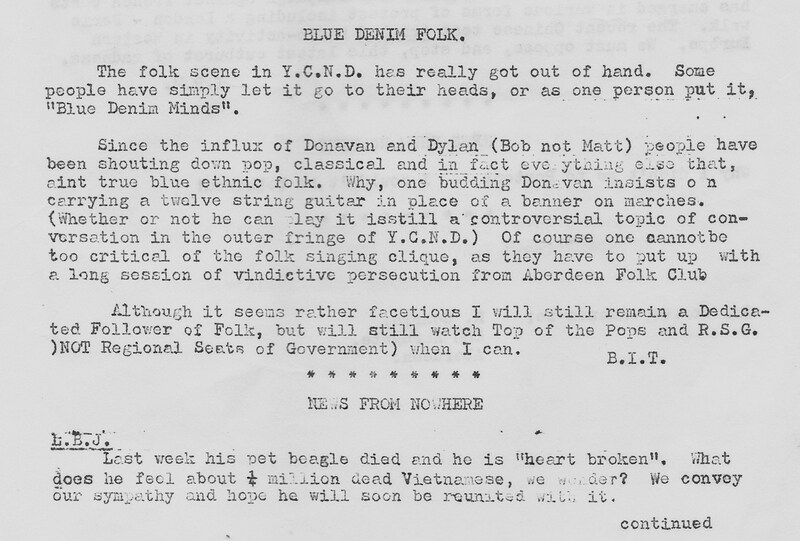 Discussed the different Y.C.N.Ds and possibility of Scottish Y.C.N.D. etc. Stayed for our tea and caught the last bus home. Dundee Y.C.N.D. does need a lift to say the least – it’s stale. They do practically nothing. The law in Dundee is much worse than ours. Aberdeen The boy from Ilford did not turn up for the meeting. Many people away at hills, different towns and I thinks some stayed away because of him.